Media captionWatch excerpts of Carole King playing Tapestry in London's Hyde Park. 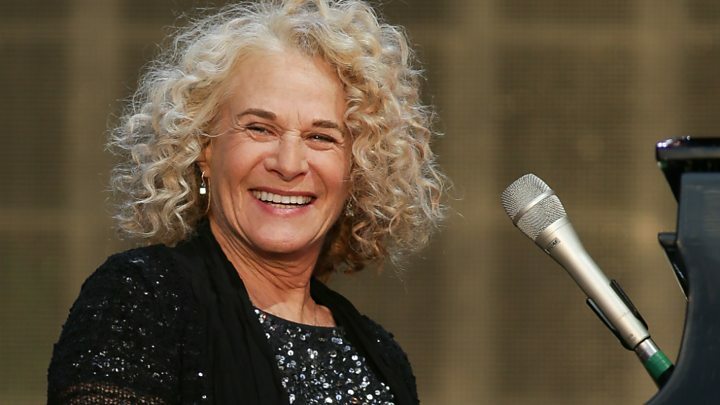 After a gap of 27 years, Carole King has returned to the UK stage to play her classic album Tapestry in full. For once, the British weather attempted to emulate the gauzy Californian heat in which the record was made, as King performed hits including I Feel The Earth Move and You've Got A Friend in the late-evening breeze. The crowd, who had paid up to £249 for the show, seemed to know every word. "This is so amazing," said King, now aged 74, from behind her piano. Some 65,000 fans attended the sold-out concert, which was part of the BST festival in London's Hyde Park. It was their first chance to see King play the UK since her City Streets tour reached the Albert Hall in 1989. Although the set remained faithful to King's 1971 masterpiece, there were a few surprises along the way. King duetted with her daughter, Louise Goffin, on Where You Lead - using alternate lyrics written in 2000, when the song became the theme to the hit US TV show Gilmore Girls. Later, King was accompanied by a recording of her younger self on a stirring version of (You Make Me Feel Like A) Natural Woman. It highlighted that King's voice now carries a pronounced rasp (she also strained for some of the higher, sustained notes) but her intimate, heartfelt delivery remained intact. "So this is what 74 looks like," she joked at one point. "I'm old and embracing it." King's audience has aged gracefully with her - and they certainly could not have been more different from the crowd that watched Florence + The Machine on the same stage 24 hours earlier. Hyde Park was strewn with picnic blankets, while the queue for coffee ran deeper than the one for beer. For decibel-damaged concert veterans, the entire show was even illustrated by sign language interpreters on the big screens. But the affection for King and her expressive, emotive songs, was undeniable. In a taped introduction, Sir Elton John said: "I can't thank Carole King enough, because without her, I would never have wanted to write songs." "There wasn't a woman on the planet Earth... sometimes your mom... who didn't take Tapestry to their heart," added actor Tom Hanks. "It was one of those timeless LPs." In an attempt to explain Tapestry to its readers, the NME recently described the album as "Adele's 21 for your nan," but even that undersells its impact. Largely self-written, it helped establish a template for female singer-songwriters which endures to this day, while King became the first woman to win the coveted record of the year award at the Grammys. Selling 25 million copies worldwide, the album clocked up the longest-ever run on the US Billboard charts (until Pink Floyd's Dark Side of the Moon overtook it a few years later) and, in 2003, it was added to the US National Recording Registry. Tapestry never quite reached those heady heights in the UK - it peaked at number four over here - but the songs, particularly It's Too Late, are enduring radio hits. Speaking to BBC 6 Music ahead of the show, King acknowledged that her concert would need to incorporate some of her other hits, saying: "It would be a very short set if I only did Tapestry." Those came in the form of a medley of songs she wrote with the late Gerry Goffin - including Take Good Care Of My Baby; Might As Well Rain Until September; Something Tells Me I'm Into Something Good and One Fine Day. She also played Chains under a projection of the Cavern Club logo - acknowledging the Beatles, who covered the song on their debut album, Please Please Me. The concert ended with The Loco-Motion and a reprise of I Feel The Earth Move, accompanied by the cast of Beautiful - the West End musical based on King's music. Overwhelmed by the response, the singer gave a final, impromptu rendition of You've Got A Friend, changing the lyrics to say: "Thank you for welcoming my friends and family. I love you, London Town." Earlier in the day, singer-songwriter Don Henley played at the festival, with a set featuring both his solo hits and songs he recorded with The Eagles. After an enthralling version of Hotel California, the singer paid tribute to his former bandmate Glenn Frey, who died in January, aged 67. "This has been a difficult year in our camp," said Henley, introducing The Eagles' breakthrough hit, Desperado. "Thank you for all your messages of support and love. The BST festival continues this week with performances from Take That, Mumford & Sons and Stevie Wonder, amongst others.